For one to have compassion towards others, I feel there is a deep need to have Self Compassion. You can find many wise teachers who profess Self Compassion as a point to leading towards compassion for others. 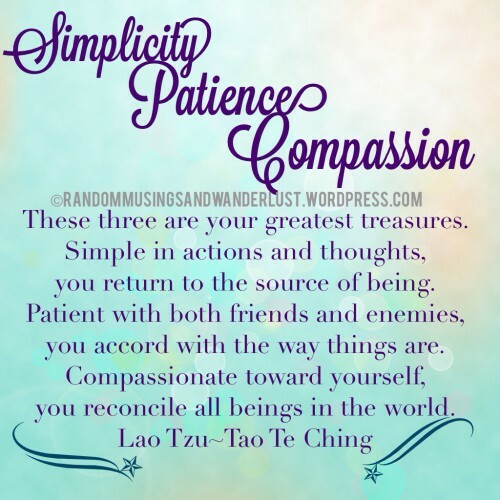 Dali Lama, Lao Tzu~Tao Te Ching, Buddha, just to name a few. Even Buddha has said Compassion that does not include self compassion is incomplete. Love, Compassion, Empathy, Patience, all must start within. I was drawn to this movement, of writing about compassion, from the moment I first read a tweet from Gene’O. This was something I needed to be involved in. The 1000 Speak For Compassion international blogging event (#1000Speak). But how? Little me, small voice, in such a huge pond. What could I possibly have to say about Compassion, that hasn’t been said before? It starts with the SELF. Me, just little me. And that’s when it hit me. It was like my heart opened up, and my eyes were seeing clearly. I have always seen myself as not being able to make an impact, I’m only one person, and often times I’ve seen myself as insignificant based on the thoughts and ideals of others. Not directly but more indirectly. But I Am. And it’s taken quite a long time to get to this point. Almost 40 years. I Am Unique and that’s pretty damn Awesome! I’ve always had less compassion for myself than I have for others. Always putting others needs before my own, making sure everyone else is happy. I’ve learned more recently in life that putting myself first, my needs, wants, desires, longings, dreams, aspirations, etc needs to come first. It’s not being selfish, it’s focusing on the priorities. If I’m not truly happy and content, as much as I want to believe I am, I am in esense short-changing myself and those around me. As I like to say, I am an ever evolving work in progress, striving to learn, grow, and better my own well being. I struggle with self compassion on an almost daily basis. There are days that are better than others, and others that are worse. It’s a process, but one I’m fully willing to embrace and work through. I want to put myself first, I must! I’ve struggled with my weight for a while. When I was young, I was actually underweight for a considerable amount of time, then I was “normal” by the doctors standards. In High School I was always seen as the girl with the pretty face, but guys would often tell me that I would be prettier if I was skinnier. I think that’s when I became more aware of how others saw me. But this was their view of me. Yes it made an impact, one I wish hadn’t. I still struggle with my weight, but not the same way I did. I don’t hate my body for all it’s been through. I admire it. Not it hasn’t bared any children, it has gone through a lot of torture though. And it has come out the other side much stronger, healthier, happier, and maybe a few pounds more than I technically should be, by doctor standards. But this body, approaching 40 is the best damn version of Paula in years! I’m proud of her. Not because of what a scale says, but for what I can accomplish. I’m not a marathon runner, I’m not a jogger, I’m not a cross-country skier, nor a distance swimmer. I walk, I hike, I take care of my body. We are only given one on this journey, and it is precious. I accept myself for my flaws as others may view them. That is their prerogative, by I choose compassion. Self Compassion. It has to start somewhere and that somewhere is me. I had over the last year compiled 2 photo collages of my transforming body. For a reminder to myself especially. I am far from where I was, back in 2000 when I had my car accident, or in 2009, suffering from severe asthma which had me pumped up on steroids. Or back in 2012 when I had fibroid surgery, and then finding out I had gluten intolerance. Having to recover and eliminate gluten at the same time was a struggle unto it self when all I was able to eat was ritz crackers with peanut butter and jelly. In a way, if it weren’t for only being able to eat those things, I fear that my health would have suffered more, because I wouldn’t have known what was causing me so much extra distress. But through it all, I’ve learned to appreciate my body. To love myself. Find that compassion for myself. All the versions of my perfectly imperfect body! Be compassionate to yourself, be kind to yourself, love yourself for all you may feel makes you “Less Than”…And embrace it. You are unique, you are rare, you are Enough. In fact, you are more than enough. All the self-doubt, negative talk, and whatever else enters your mind, needs to be taken out with the trash. You are so much better than all of that. WE ALL ARE! Love towards others has an origin in love and care of oneself. When a compassionate person really understands themselves, that is when they understand others. https://www.facebook.com/1000VoicesSpeak (you can find over a thousand other bloggers discussing compassion in its various forms, by following this link to the facebook page. Search Twitter, Facebook, and any other social media outlet with the hastag #1000Speak and you will also find more Compassionate posts. The purpose is to flood the internet with an abundance of compassionate posts in all various forms. Please take the time to read some of the other wonderful posts out there. I will be ReTweeting most of them myself. You can also follow me @Lilly2412 on Twitter.